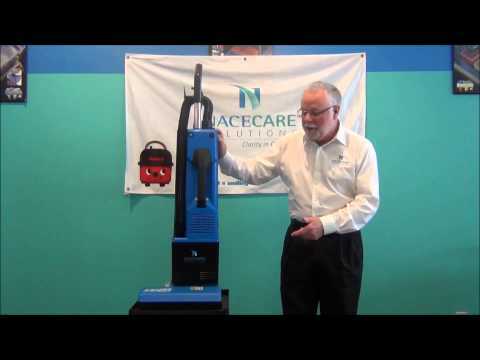 NaceCare™ HD Dual Motor Upright Vacuum - 14" | Easy Way Cleaning Products Ltd.
NaceCare™ HD Dual Motor Upright Vacuum - 14"
Vac motor: 1000 watt; Waterlift: 118"; Airflow: 63 CFM; Brush motor: 200 watt; Brush RPM: 4000 RPM; Capacity: 6.5 quart; Weight: 16 lbs. 1.3 HP. 4-position brush height adjustment with indicator light. Bag full indicator light. Won't run without a bag installed. Electronic brush shut off protects motor if the brush becomes jammed. Upper body goes right to the floor to get under beds and furniture. Quick change brush strip. Four-stage filtration standard. "V" belt for long life. 4:1 stretch hose. Dual motor performance. Carpet and Rug Institute certified.